The first thing, and the only just realized in the shop, is that thread matters. This is a science thing. (It is funny that two people who nearly majored in sciences took years to apply science to the process, but, you know, someone tells you how to do stuff and then what’s the point in thinking, right?) Nylon likes electrons. I’m not sure if polyester has extras, or if poly is just a bad friend that encourages nylon to go home with strange electrons, but you really don’t want to get nylon and poly getting together. 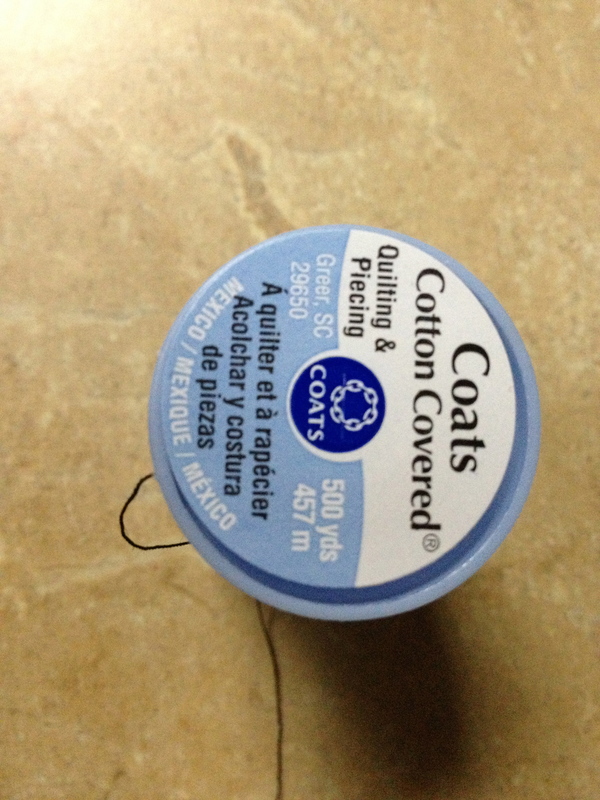 Unfortunately, your average all-purpose sewing thread is a cotton-poly blend. It’s mas annoying to try to gather something when the gathering thread has developed the static electricity version of suction. (This is actually more of a problem on an industrial machine than on a homesew. I’m thinking it has something to do with the beefy electro-magnet in the servo motor.) My boss read that the internet recommended all cotton thread to get past this problem. Well, people, I’m here to tell you that while this does solve the static issue, it breaks. The thread, I mean. Cotton thread is more delicate than I’d like. The polyester in cotton-poly thread is there for strength and resilience. Also, all cotton thread has a much greater “slip” than all-purpose thread, so you’ll have to adjust the tension on your machine. (I found that putting the bobbin in so it feeds straight, instead of doubling back worked pretty reliably on several machines.) The cotton thread still snaps, don’t get me wrong, but not because of the tension. Turns out that cotton covered polyester thread is the magic answer here. It’s hiding out with the quilting threads. Cotton covered polyester thread seems to fix the static issues pretty well without being all snappy-breaky-why-thread-why-do-you-hate-me?!?!?! the way 100% cotton thread can be. It still has the tension problem, because of the very smooth surface of the thread. On the plus side, it does gather like a champ. And there’s a lot of gathering in a tutu. There is a lot of tulle in a tutu. I don’t think I can emphasize this enough. Each layer of a tutu puts at least 108″ of tulle onto the basque in a romantic tutu – double that for a pancake. The last batch of romantics we made in the shop were for Les Sylphides. They were each 8 layers of tulle, mounted on a 4″ wide basque. That is a lot of heavily gathered tulle that has to sit very close together. This is how tutus work – you chuck way too much tulle into way too little space, and you get a big fluffly thing. Awesome. Doing this without going insane is the harder part. I’ve heard tales of careful marking and pinning. You probably know, by now, that I’m not really all about that. ;) Yes, it is the Right Way To Do It™, but it is not the only way to do it. It’s also not actually the easiest way to do it, in my experience, not the way that will keep the gosh darned layer of tulle under control so you’re not sewing all wibbly-wobbly. I keep a firm hold on my gathering thread when I’m sewing the layers down. This means I can “steer” the layer around the curve of the basque easily. My left hand goes firmly down on top of the tulle, right next to where the machine foot will be. This means that there are no little poofy gathery bits sticking up for the foot to get stuck in. The two biggest time/sanity sinks in the tutu sewing process (or any other large-gathered-layer-application prodess) tend to be 1) keeping the gathered layer from getting all squirrely between pins and 2) keeping the toes of the machine foot from getting stuck in the gathers. Keeping the gathering thread under tension solves the first one. A little smashy-flatty action with your left hand solves the second. Love your writing style. Oh, and thanks for the hints on harnessing the power of the tutu. I have not done a lot of tutus but have worked with tulle often enough to learn a few tricks to wrangle it. I find that placing a ruler over the tulle on the left side of the presser foot works best for me. 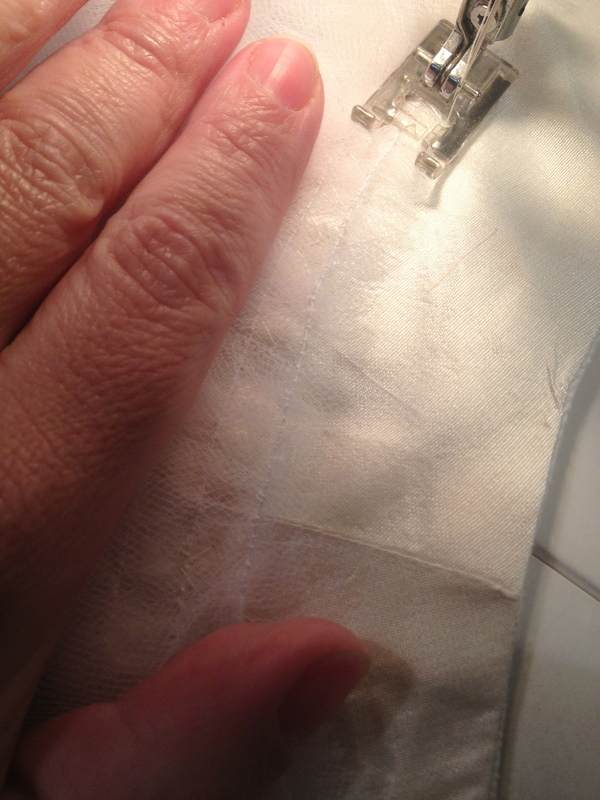 I can compress the tightly gathered tulle with just a little pressure on the ruler as it feeds through sewing machine. I’ve sewn quite a few miles of tulle for costumes, but now that I’m on my second wedding gown, this gathering task is giving me pause. Thank you SO much for sharing the smashing-ruler hint – brilliant. Thank for you for the thread advice. The regular thread is giving me more trouble than usual, and since I’m off to the fabric store today, I’ll absolutely try the cotton-covered-poly quilting thread. This is all very helpful but how do you stop the bottom edge catching on itself. I recently finished 4 romantic tutus with a single layer on the top which kept hooking itself to itself and its neighbouring dresses! How to prevent this, without having to sew on miles of very fine ribbon, I would dearly like to know! I can’t see myself chasing a room full of kids and adults in swan costumes, with a spray bottle of fabric softener and water because the problem is not static it’s not physics its mechanical, the cut ends act like little hooks and the rest of the tulle like little eyes and before you know it, the bottom of the dress looks like a very badly made bubble hem! Omg, Angela, you have painted quite a picture there! I’m laughing, but I also wouldn’t want to be chasing a troupe around with a spar bottle! We always staggered the layers of tulle at the shop I worked at. I was told it was so the layers all looked even at the end, but we never had the problem you’re describing so maybe that helped? The top layer was always illusion (very fine tulle), and any more aggressive tulle was down a few layers. I do know the problem you’re describing well, though – tulle and especially net are like a Velcro and a sheet of paper made a ba-bah. I always run into that sad fact when making veils with multiple layers. Thanks for the reply :) I bought a professional tutu maker’s pattern as this was my first romantic tutu. 4 layers in 3 rows on a basque. Row 4 – soft white bridal tulle, row 2 – 1 layer stiff “royal blue” (was very pale and more aqua) crystal organza which doesn’t fray and is a substitute for the dress net specified in the pattern and layer 2, row 2- a soft flowing beautiful vibrant royal blue crystal organza that I bought because I ran out of the first kind, thinking the second kind would be the same but I discovered that all organza is not made equal! I had to zig zag hem it twice – once with matching thread and once with a gold top thread to have any hope of stopping it looking like a badly cut blue wig at the bottom! row 1- white soft bridal tulle with a gold ribbon sewn on about a third of the way up while flat, which gave it a bit of a three dimensional effect – except for the unwanted and unforeseen Velcro effect on the bottom. Apart from substituting the fabrics for row 3, I followed the pattern to the letter. Row 4 was completely bunched up but not too visible because it was covered by the two layers at row2.